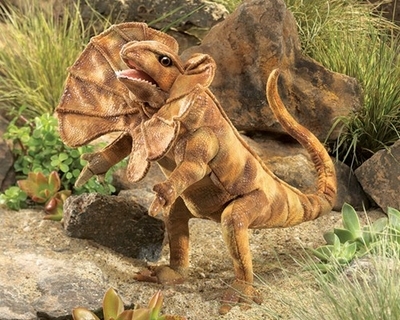 Folkmanis 3046 – In a quirky stance and ready to play, the FRILLED LIZARD puppet is full of surprises. With multiple variations of movement in his mouth and forelegs, you can even make his collar frill forward and back with a gentle squeeze of your fingers. Movable mouth and forelegs, expanding frill. Squeeze airbag to animate frill. Measures 18” x 11 x 8”.